These puff pastry-wrapped pears are so elegant, you won’t believe how easy they are to make! 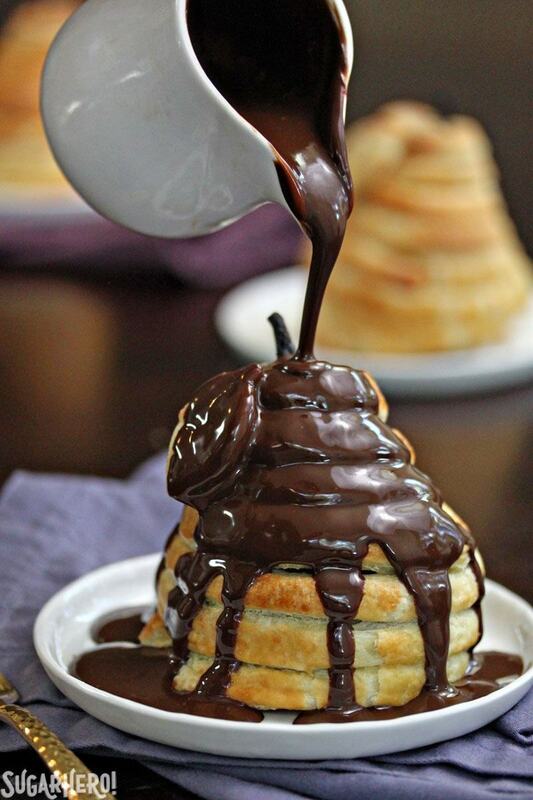 Serve them with chocolate espresso sauce for the perfect bittersweet accompaniment. 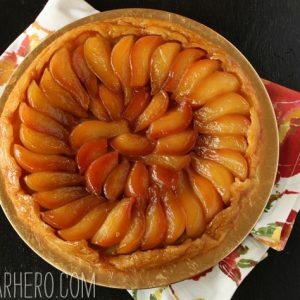 You’ll be seeing plenty of pear recipes from me this fall, but these puff pastry beauties were so spectacular—and so easy!—I just had to share them first. Frozen puff pastry is one of my favorite desserts hacks. You buy a box for a few dollars, wait for it to defrost, add a few toppings, bake, and are crowned a pastry goddess. Using puff pastry is a sure way to impress people without breaking a sweat, which is basically always my goal in life. I like to get my puff pastry from Trader Joe’s, because it’s made with all butter and tastes amazing. It’s only available during the holidays, though, so I’m no strange to Pepperidge Farms puff pastry either. Whatever brand you find will work just fine. We’re not fancy here! Strips of that store-bought puff pastry are wrapped around soft, peeled pears. Usually I would advocate poaching the pears, but in my case, my pears were so ripe, poaching was completely unnecessary. So if your pears are ripe and soft enough, you can skip the poaching step and shave a good 20 minutes off the prep time. Neglecting your produce sometimes pays off! So after the pears are wrapped, they’re baked until golden brown and crispy. At this point, you can just enjoy them plain or top them with vanilla ice cream, whipped cream, caramel sauce…basically, all of the usual dessert suspects. I decided to make a chocolate-espresso sauce—a truly bittersweet, silky sauce that perfectly countered the sweet, juicy pear and the buttery, crispy pastry. It’s a very “adult” flavor, so if you’re making this for mixed ages, I’ve included instructions for omitting the espresso and just making a basic chocolate sauce. 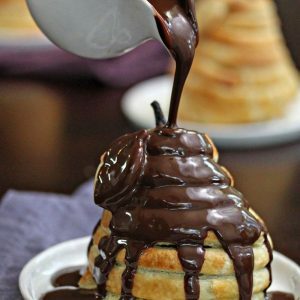 If I were making these for a dinner party, I’d probably provide a variety of accompaniments—why not have chocolate sauce AND caramel sauce AND raspberry sauce to choose from? 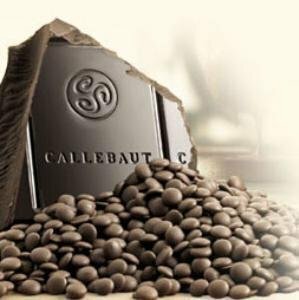 But for my family, for our casual Sunday dinner, just the chocolate was enough. My 4-year old wasn’t sold on these pears (he has not really discovered the joys of cooked fruit yet) but everyone else swooned, and I basked in their compliments, and preened like a swan, and never once mentioned how easy it all was. On a different note–have you signed up for my newsletter yet?! I’ve started a new weekend series called Saturday Sweets, and you won’t want to miss it! There’s a weekly wrap-up, exclusive recipes and content just for subscribers, and rotating features that YOU can request! If you’re not on the list already, clicky right here and get yourself signed up. xoxo! 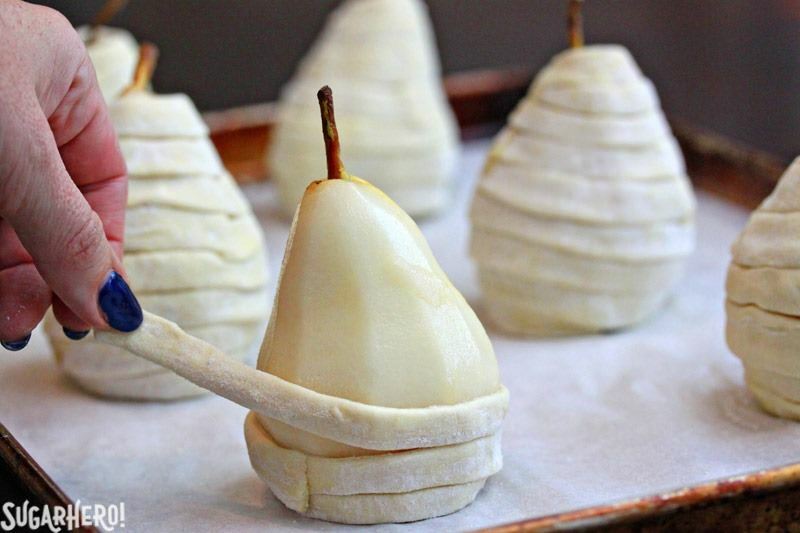 These puff pastry-wrapped pears are so elegant, you won’t believe how easy they are to make! 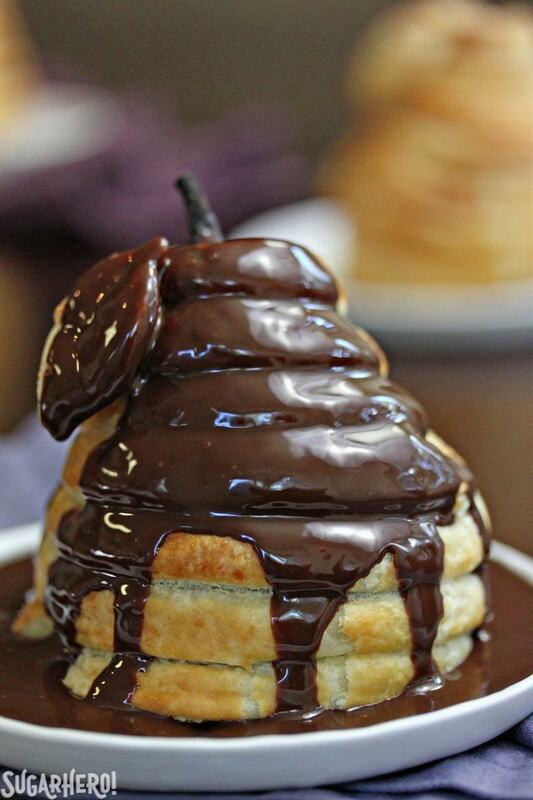 Serve them with chocolate espresso sauce for the perfect bittersweet accompaniment. 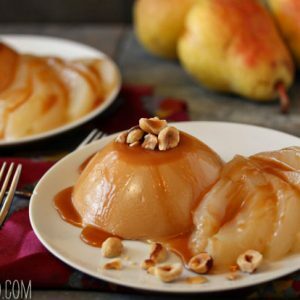 This recipe calls for poaching the pears before baking them, but if your pears are quite ripe and soft, the poaching step can be skipped and you can go straight to baking. Place the chopped chocolate in a medium bowl. Pour the cream into a small saucepan, and place over medium heat. Heat the cream until it is almost boiling, and bubbles appear all along the sides of the pan. Pour the hot cream over the chopped chocolate, and let it sit for a minute to soften the chocolate. Add the hot espresso, and whisk everything together until your sauce is shiny and smooth. Use it right away, or if you’re saving it for later, press a layer of cling wrap directly on top of the chocolate sauce. Store in the refrigerator for up to a week. If the sauce has been refrigerated, microwave it in short bursts and whisk until it is once again liquid, shiny, and smooth. Use a small paring knife to core the pears from the bottom, removing the core and seeds. Leave the stems attached. Peel the pears. If your pears are hard, proceed to the poaching step. If they’re very ripe and soft, skip the poaching and go straight to the puff pastry step. To poach the pears: combine the water, sugar, cinnamon sticks, vanilla, and lemon slices in a large saucepan over medium heat. Stir while the sugar dissolves, and bring the mixture to a low boil. Add the pears, and reduce the heat to medium-low. Poach, uncovered, for 18-20 minutes, until the pears are tender but not mushy. Remove the pears with a slotted spoon and let them cool to room temperature. 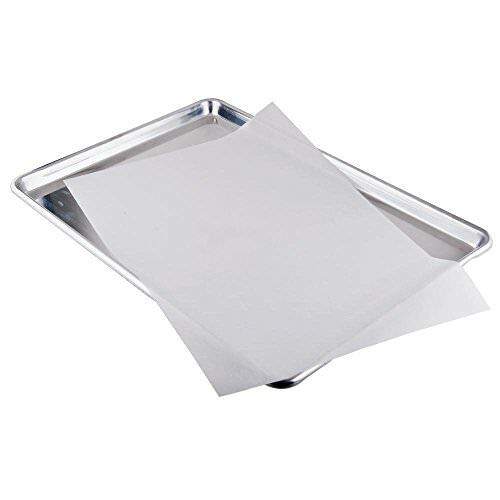 Preheat the oven to 400 F. Line a baking sheet with parchment paper, and set the pears on the baking sheet in evenly spaced intervals. Lightly flour your work surface, and carefully unfold a sheet of puff pastry, pressing any cracks back together with your fingertips. 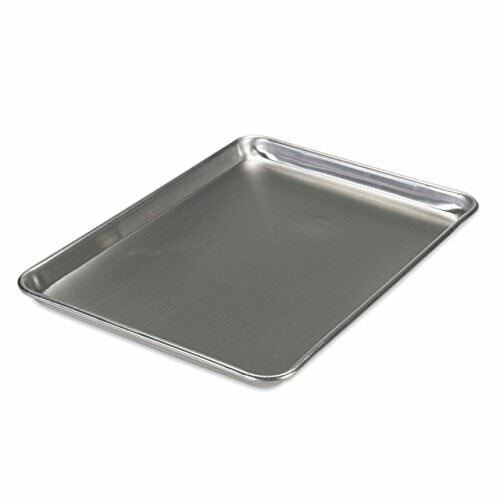 Use a pastry wheel or sharp knife to cut the pastry into ½-inch strips. Whisk the egg in a cup or small bowl. Start at the bottom of a pear, and wind a strip of pastry around the base. When the strip ends, brush a little bit of beaten egg on the end, and press a new strip on top of it. Continue winding strips of pastry around the pear, covering it completely, until you get to the top. Repeat with the remaining pears and puff pastry. 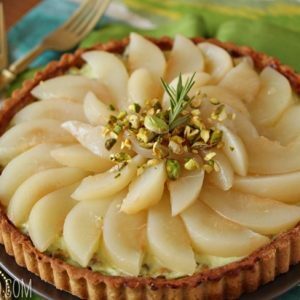 If you have extra pastry, you can use a small leaf cutter to cut out pastry leaves, and glue them to the tops of the pears with egg wash.
Brush the pears all over with the egg, and sprinkle with granulated sugar. Bake for 20 minutes, and if you notice the tops of the pears are getting dark, place a small tent of foil on top of each pear to prevent the tops from burning. Bake for an additional 5-10 minutes, until the sides of the pear are golden brown. Let the pears cool slightly, until they’re warm but not hot, and serve with a generous drizzle of warm chocolate syrup on top. I saw these on FB and had to head over to check them out. WOW, just wow they look amazing! Thanks so much, Cindy! Facebook is constantly showing me tasty recipes and making me hungry. Glad you came over to take a peek! 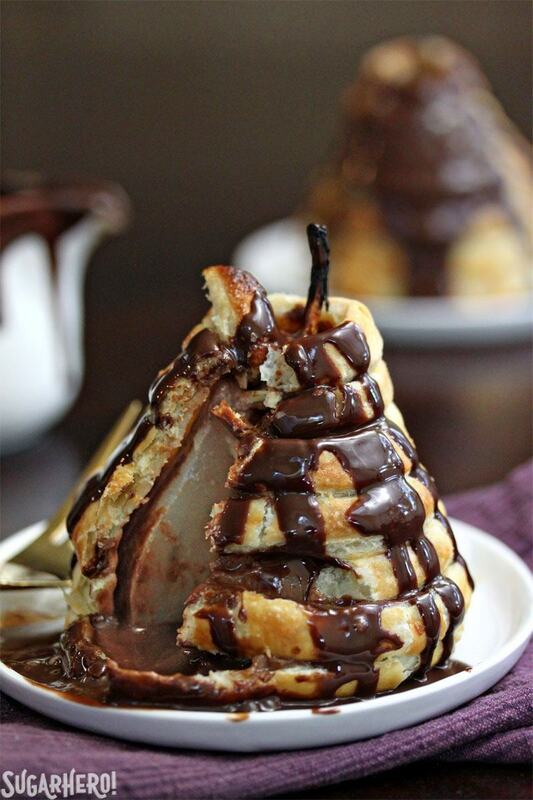 I can imagine how soft and delicious the pears are, covered in crunchy pastry and melted chocolate! Sounds SO good! Thanks Diana! It’s definitely my new favorite way to enjoy pears. Super simple but still really elegant! What an elegant dessert! These would be perfect for a dinner party. Beautiful! Thank you Amy! These are TOTALLY dinner party appropriate. Fancy but easy! Those pears are gorgeous! Totally agree on puff pastry making the easiest, most complement-receiving desserts ever. I’ve made it by hand a few times and it’s totally not worth it – the stuff in the box is almost as good and zero work. Can’t beat it! Thanks Julie! Honestly, what would we do without puff pastry? How else do you impress people with zero effort? 😉 I’ve only made it by hand in culinary school, and even then, I was like, this is ridic. Do you people know you can buy this in stores?? What the what? WOW! These pears look incredible. 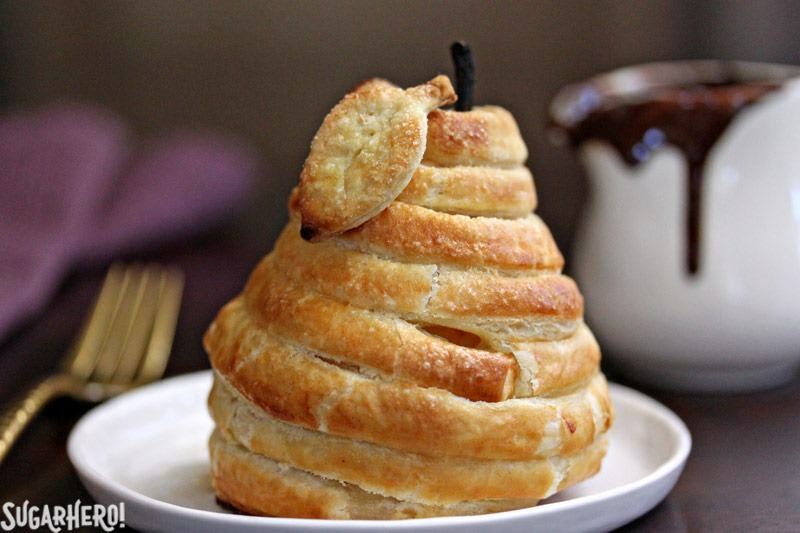 I love puff pastry, but would have never considered wrapping them around the pear like that. Love it. I can’t wait to try these. Thanks Kristine! It’s a game-changer for sure. 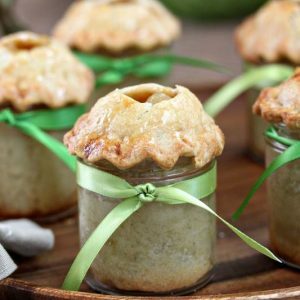 I’ll bet you could also do it with poached apples to make a fun twist on apple pie. These are such a gorgeous dessert! 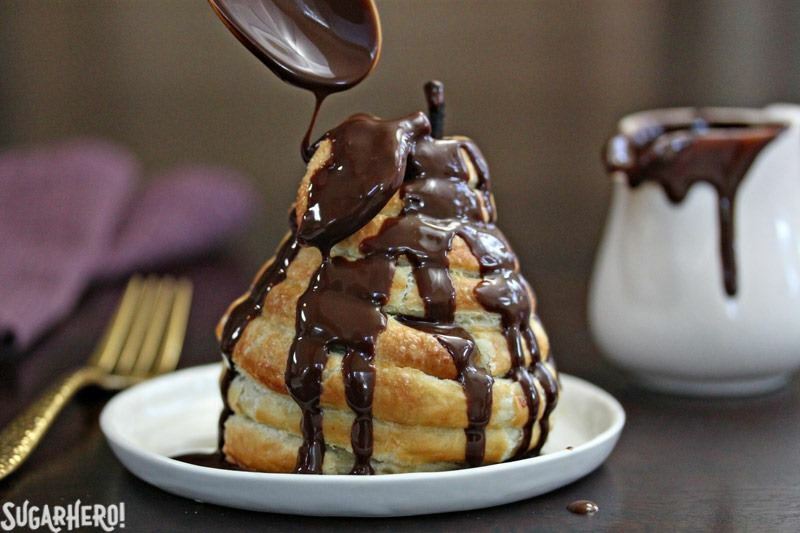 I would have never thought to wrap puff pastries around a pear! Thanks! It’s kind of changed my life…now I want to puff pastry all the things!